Single-cell genomics plays a crucial role in several aspects of biology, from developmental biology to mapping every cell in the human body through the Cell Atlas initiative. To meet these various applications, single-cell methods are rapidly evolving to increase throughput; improve sensitivity, quantification accuracy, and usability; and reduce nucleic-acid amplification bias and cost. 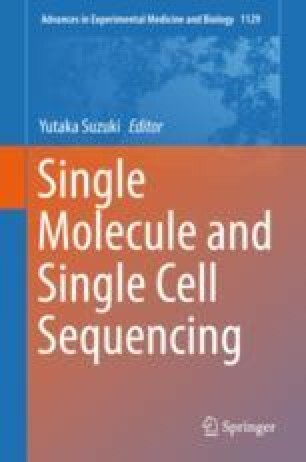 In addition to improvement in single-cell methods, there is a huge interest in analyzing multiple analytes such as genome, epigenome, transcriptome, and protein from the same single cell. This approach is generalized as single-cell multi-omics. Automation of multi-step single-cell methods is highly desired to achieve a reproducible workflow; reduce human error and avoid contamination; and introduce technical variability to an existing stochastic process. Typically single-cell reactions start with a low level of nucleic acid, in the range of picograms. Miniaturization in microfluidic devices leads to a gain in reaction efficiency in Nanoliter or picoliter reaction volumes and active mixing help ensure that solid-state microfluidic devices provide the broadest flexibility and best sensitivity in single-cell reactions, compared to other methods. In this chapter, we will present integrated fluidic circuit (IFC) microfluidics for various single-cell multi-omics applications, and show how this technology fits into the current single-cell technology portfolio available from various vendors. We will then discuss possible uses for IFCs in multi-omics applications that are on the horizon. Rotem A, Ram O, Shoresh N, Sperling RA, Goren A, Weitz DA, Bernstein BE. Single-cell ChIP-seq reveals cell subpopulations defined by chromatin state. Nat Biotechnol. 2015;33(11):1165–72. https://www.nature.com/articles/nbt.3383.